The first time you joined a multi player game you probably didn't think about setting your call sign up so you probably joined with one of the defaults. If you choose Landmark Livery it's an odds on bet you joined the session with the call sign "Landmark 1123"
If you did this is how ATC will see you on the radar screen. You notice I changed my call sign to 601 from the default 1123. It really is annoying doing ATC with people who don't change the defaults for the simple reason that if someone else joins with the same call sign everyone gets confused! So get in the habit of changing your call sign after you've choosen your aircraft. Click the change button as highlighted below. 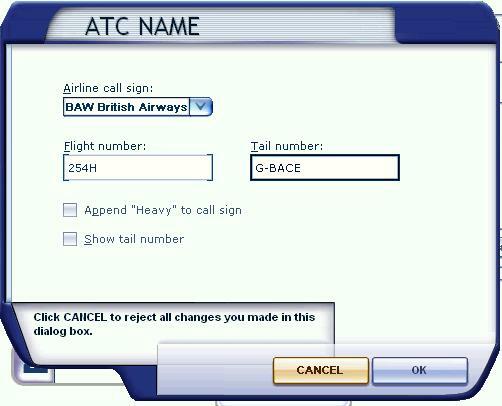 NOTE: If a call sign is selected then ATC will only see this and the flight number. If you select - None as the callsign then ATC will see your Tail number. Small props flying VFR etc should use this method. Question: How can I choose real life call signs. 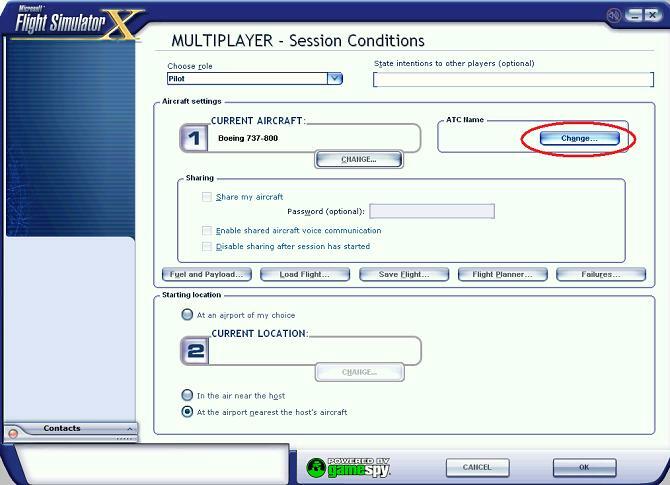 Answer: The list of airlines comes from a simple textfile called airlines.cfg that you can find in the main fsx folder. Just edit with notepad and save and the new airline will appear next time. Take British Airways as an example. If I add this to airlines.cfg then ATC will now see me like below. However there are two faults with this. Firstly the shortened code becomes BRI601. BA's code is actually BAW and ATC can (cough and has) be confused with what BRI stands for. It could be British Midland, Brit air. OK not the end of the world but how many airlines start with AIR? To make matters worse the callsign really refers to how the airline is reffered to over the radio. For British Airways this is Speedbird. OK most of us in the UK pick this up very quickly but ATC struggle with some of the more obscure airlines. Titan Airways is ZAP, US Airways is CACTUS etc. After much thought FSopen is proposing a new standard that combines all of the above with this format. So ATC would see a British airways plane like this. And as the shortened version takes the 1st 3 characters the airline code is always correct. Finally we've done most of the work for you already. Simply right click on this file airlines.cfg and save, overwriting the current version on your PC. The file needs to be saved in something like C:\Program Files(x86)\Microsoft Games\Microsoft Flight Simulator X.